Two days ago, we exclusively brought you the specifications of the OPPO A3s. 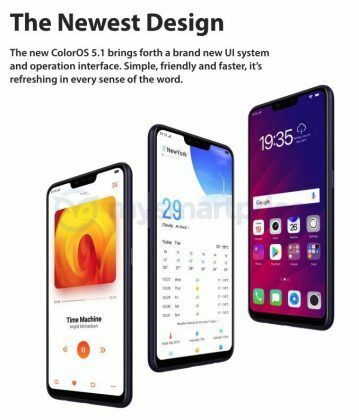 Now, we’re exclusively bringing you the features, images, as well as specifications of the yet unannounced smartphone. 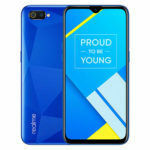 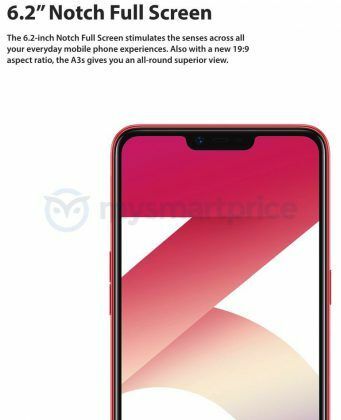 The OPPO A3s appears to be a lower mid-range Android smartphone with a huge screen with a notch, an octa-core processor, dual-camera setup with AI, Face Unlock, and a huge battery capacity. Let’s have a detailed look at the OPPO A3s. 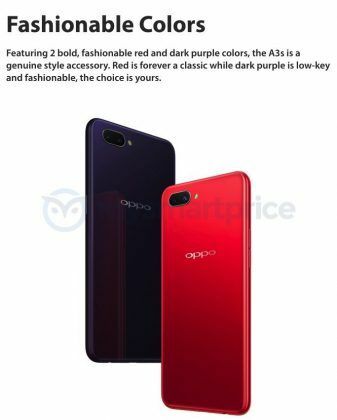 The OPPO A3s has a glass back, and will be available in two fashionable colours: Dark Purple and Red. 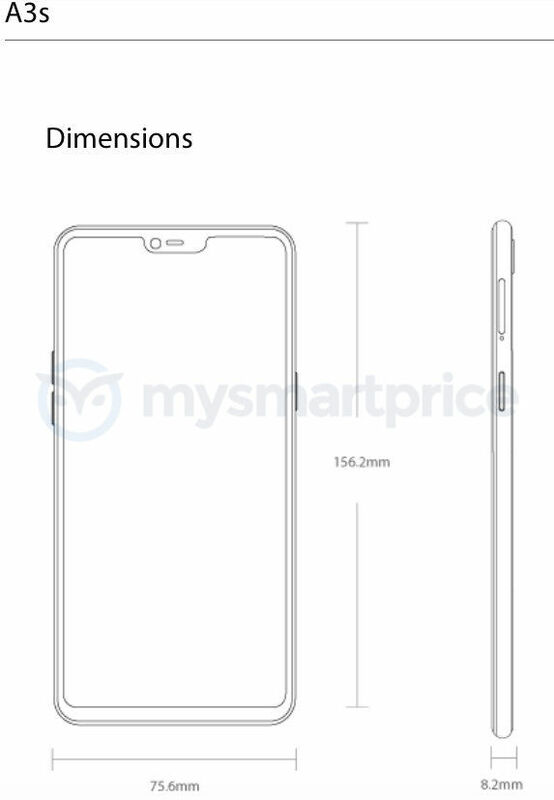 At the front, you can see a bezel-less screen with an iPhone X-style notch. 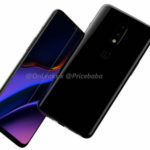 At the rear, there appears to be a horizontally-laid dual-camera setup with an LED flash and OPPO branding. 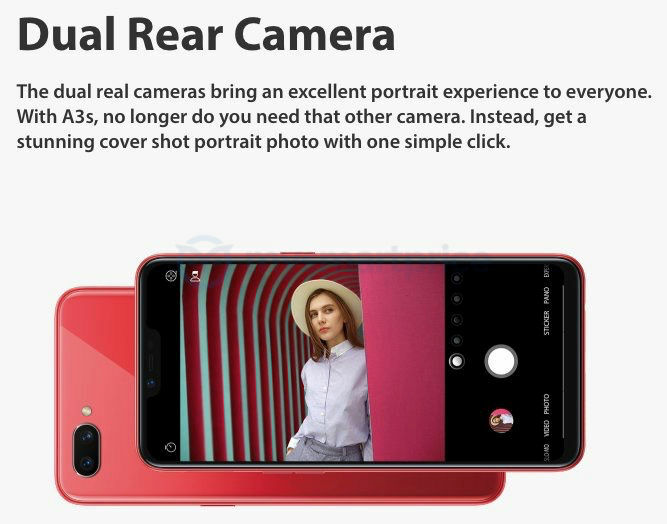 There’s a power/lock button on the right and volume buttons on the left of the phone. 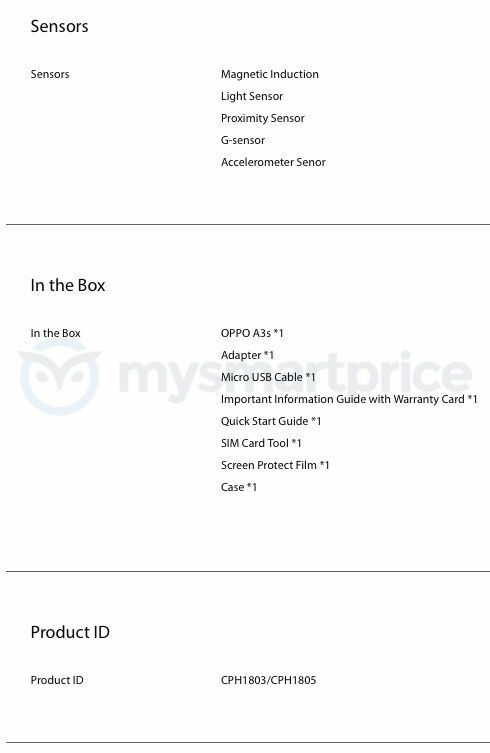 There’s a microUSB 2.0 port at the bottom along with a 3.5mm headphone jack. The OPPO A3s (model numbers: CPH1803 and CPH1805) features a 6.2-inch In-Cell IPS LCD screen with an ability to display 16 million colours. 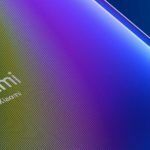 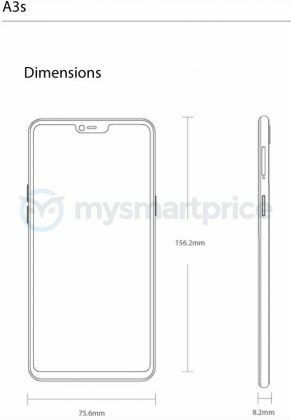 There are minimum bezels all around, but there’s a screen notch at the top, just like the iPhone X and many recently launched Android smartphones. 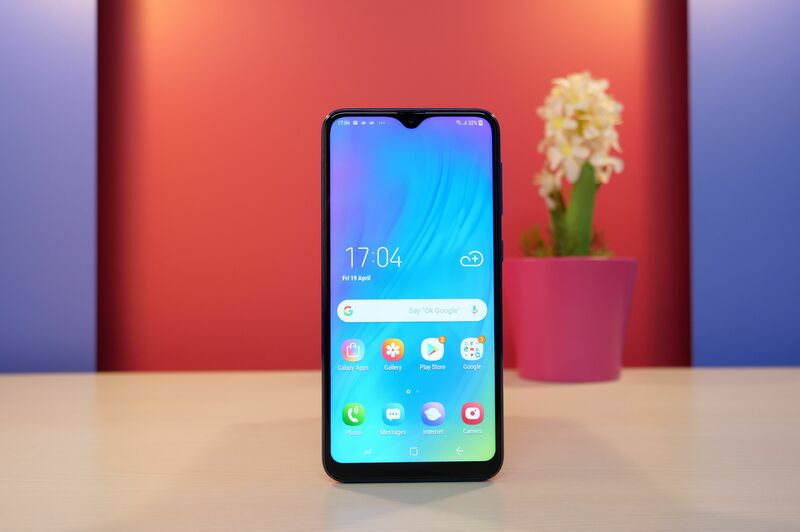 The screen resolution is HD+ (1520×720 pixels), resulting in an aspect ration of 19:9. 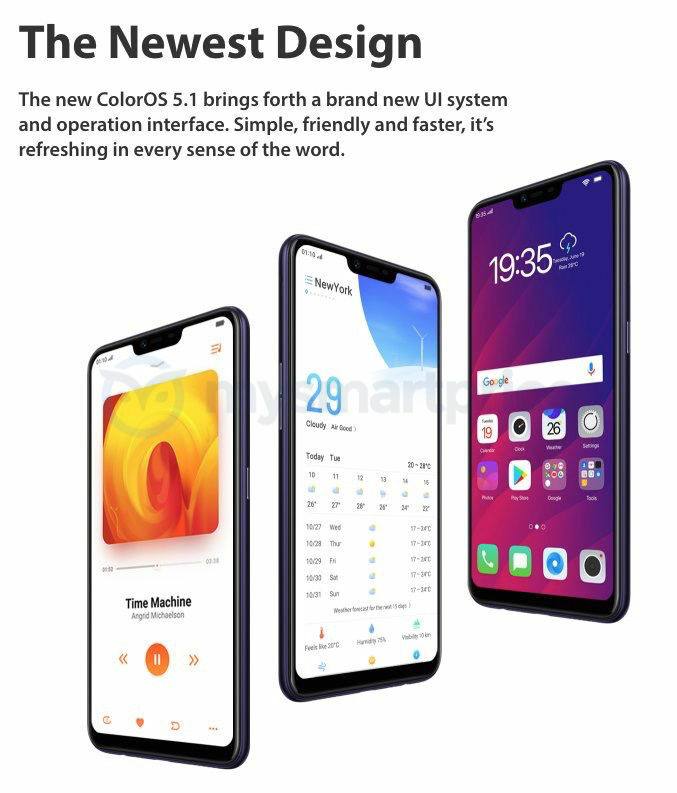 It runs Android 8.1 Oreo based ColorOS 5.1, and uses the Qualcomm Snapdragon 450 chipset. 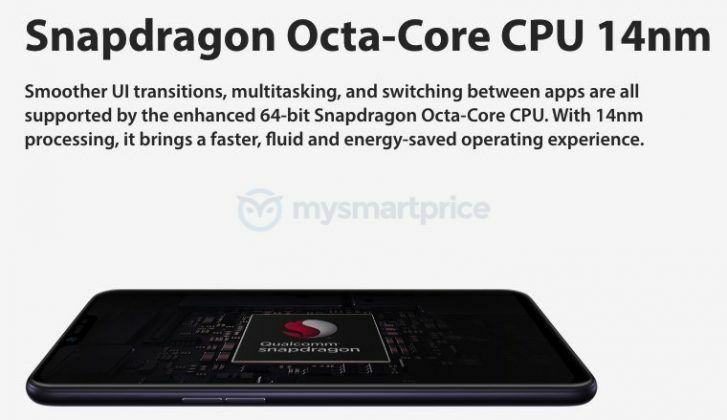 There’s 2GB RAM, 16GB internal storage, and a microSD card slot. It also comes packed with a huge, 4230mAh battery, which should last more than a full day of heavy usage. 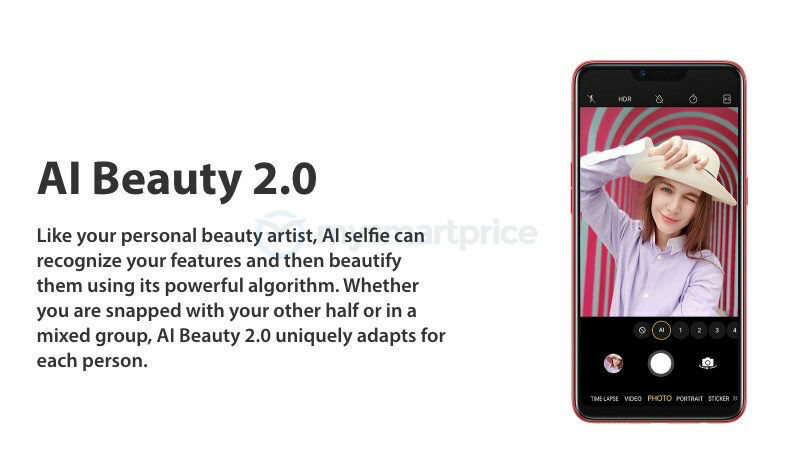 The phone will come with a 13MP+2MP dual-rear-facing camera setup with f/2.2 aperture for the primary sensor and f/2.4 aperture for the secondary sensor. The rear-facing camera can click images with background blur effect and capture 1080p videos. 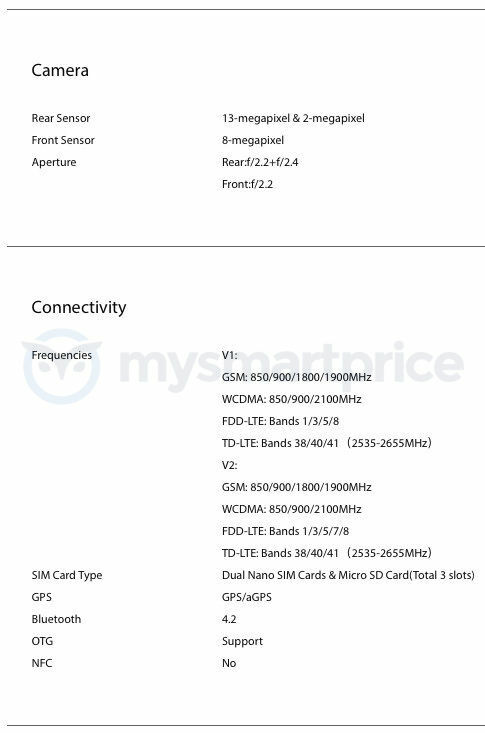 The 8MP front-facing camera has f/2.2 aperture and a fixed focal length. The selfie camera also features AI Beauty 2.0 feature for improving facial features of a person. 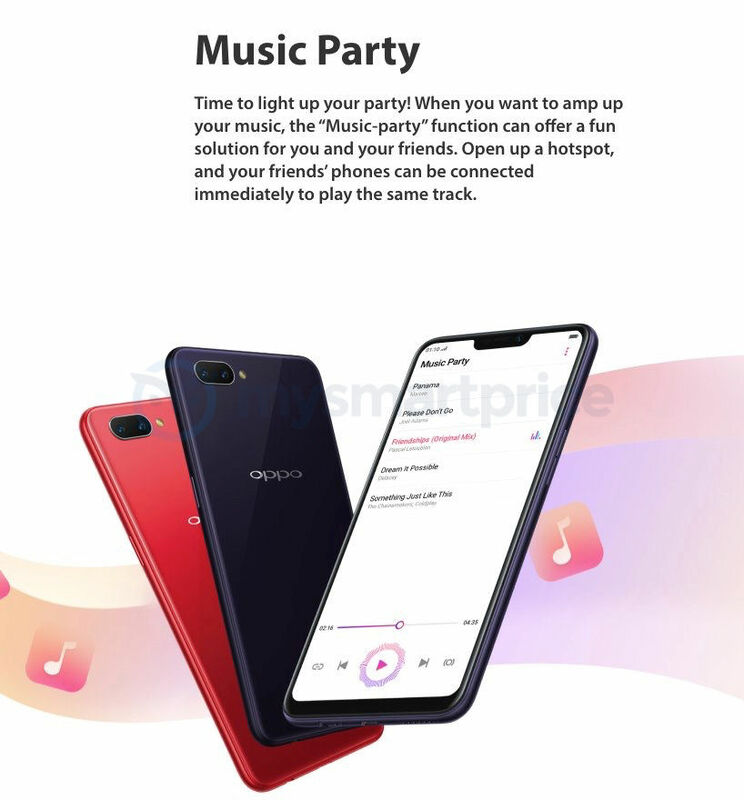 The Music Party feature, which can play the same song at the same time from two OPPO A3s. 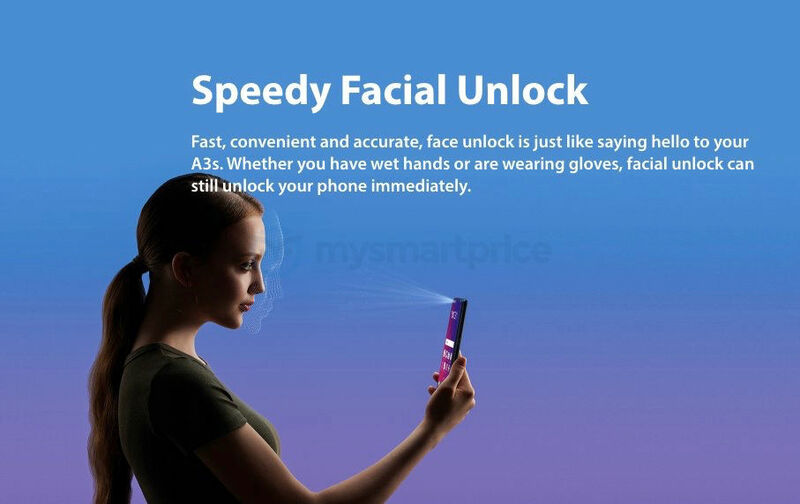 It seems like a gimmick, straight from the Samsung Galaxy S3 days. 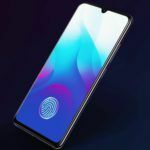 The phone lacks a fingerprint reader, and relies on a speedy Face Unlock method for user authentication using the front-facing camera. 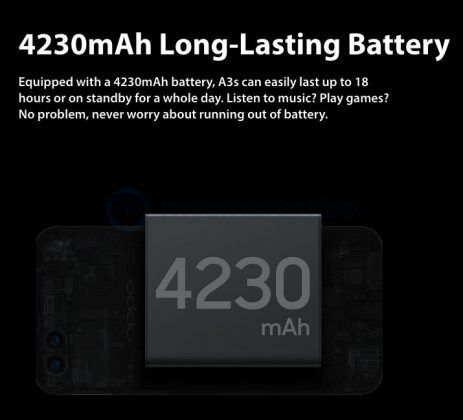 Connectivity features include a dual-SIM card slot, 4G LTE, GPS/A-GPS, Bluetooth 4.2, microUSB 2.0 port, and a 3.5mm headphone jack. The OPPO A3s measures 156.2×75.6×8.2mm and weighs 168 grammes. 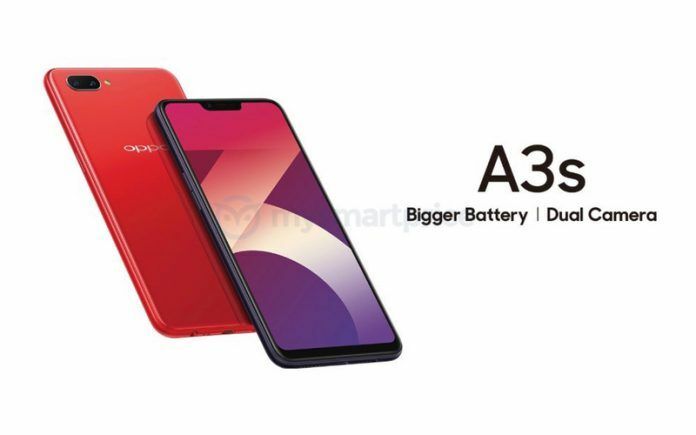 While we don’t know the launch date of the OPPO A3s, we certainly know that the launch of the smartphone could happen anytime now. 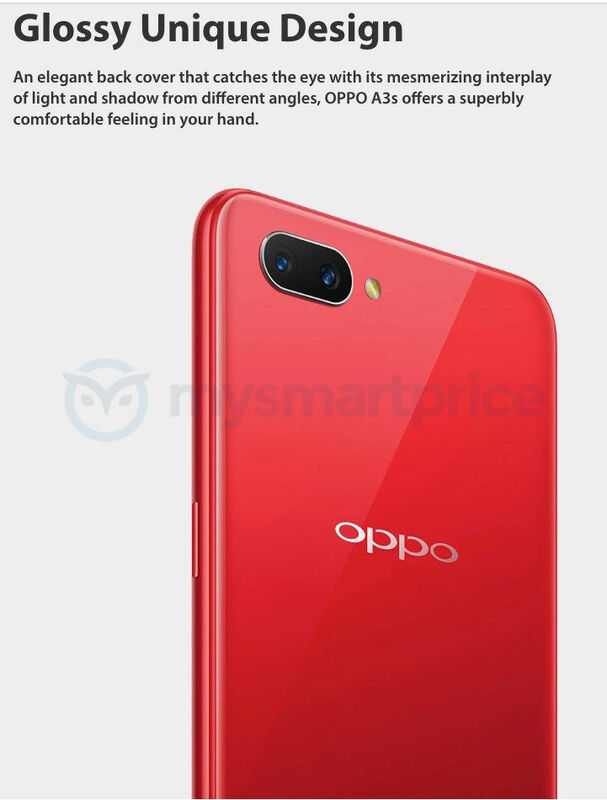 Going by the specifications of the phone, it looks like it’s a rebranded OPPO A5, and could be launched outside of China with this new name.